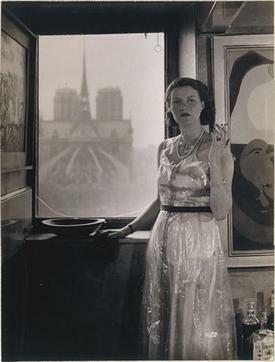 Peggy Guggenheim, c.1930, Paris, photograph Rogi André (Rozsa Klein). In the background, Notre Dame de Paris, and on the right, Joan Miró, Dutch Interior II (1928). Marguerite "Peggy" Guggenheim (August 26, 1898 – December 23, 1979) was an American art collector, bohemian and socialite. Born to the wealthy New York City Guggenheim family, she was the daughter of Benjamin Guggenheim, who went down with the Titanic in 1912, and the niece of Solomon R. Guggenheim, who would establish the Solomon R. Guggenheim Foundation. Peggy Guggenheim created a noted art collection in Europe and America primarily between 1938 and 1946. She exhibited this collection as she built it and in 1949, settled in Venice, where she lived and exhibited her collection for the rest of her life. The Peggy Guggenheim Collection is a modern art museum on the Grand Canal in Venice, Italy, and is one of the most visited attractions in Venice. Both of Peggy's parents were of Ashkenazi Jewish descent. Her mother, Florette Seligman (1870–1937), was a member of the Seligman family. When she turned 21 in 1919, Peggy Guggenheim inherited US$2.5 million, about US$36.1 million in today's currency. Guggenheim's father, Benjamin Guggenheim, a member of the Guggenheim family, died in the sinking of the RMS Titanic, and he had not amassed the fortune of his siblings; therefore her inheritance was far less than the vast wealth of her cousins. She first worked as a clerk in an avant-garde bookstore, the Sunwise Turn, where she became enamored of the members of the bohemian artistic community. In 1920 she went to live in Paris, France. Once there, she became friendly with avant-garde writers and artists, many of whom were living in poverty in the Montparnasse quarter of the city. Man Ray photographed her,  and was, along with Constantin Brâncuși and Marcel Duchamp, a friend whose art she was eventually to promote. She became close friends with writer Natalie Barney and artist Romaine Brooks, and was a regular at Barney's stylish salon. She met Djuna Barnes during this time, and in time became her friend and patron. Barnes wrote her best-known novel, Nightwood, while staying at the Devon country house, Hayford Hall, that Guggenheim had rented for two summers. Her first gallery was called Guggenheim Jeune, the name being ingeniously chosen to associate the epitome of a gallery, the French Bernheim-Jeune, with the name of her own well known family. The gallery on 30 Cork Street, next to Roland Penrose's and E. L. T. Mesens' show-case for the Surrealist movement, the London Gallery, proved to be successful, thanks to many friends who gave advice and who helped run the gallery. Marcel Duchamp, whom she had known since the early 1920s, when she lived in Paris with her first husband Laurence Vail, had introduced Guggenheim to the art world; it was through him that she met many artists during her frequent visits to Paris. He taught her about contemporary art and styles, and he conceived several of the exhibitions held at Guggenheim Jeune. The Cocteau exhibition was followed by exhibitions on Wassily Kandinsky (his first one-man-show in England), Yves Tanguy, Wolfgang Paalen and several other well-known and some lesser-known artists. Peggy Guggenheim also held group exhibitions of sculpture and collage, with the participation of the now classic moderns Antoine Pevsner, Henry Moore, Henri Laurens, Alexander Calder, Raymond Duchamp-Villon, Constantin Brâncuși, John Ferren, Jean Arp, Max Ernst, Pablo Picasso, Georges Braque and Kurt Schwitters. She also greatly admired the work of John Tunnard (1900–1971) and is credited with his discovery in mainstream international modernism. When Peggy Guggenheim realized that her gallery, although well received, had made a loss of £600 in the first year, she decided to spend her money in a more practical way. A museum for contemporary arts was exactly the institution she could see herself supporting. Most certainly on her mind also were the adventures in New York City of her uncle, Solomon R. Guggenheim, who, with the help and encouragement of Hilla Rebay, had created the Solomon R. Guggenheim Foundation two years earlier. The main aim of this foundation had been to collect and to further the production of abstract art, resulting in the opening of the Museum of Non-objective Painting (from 1952: The Solomon R. Guggenheim Museum) earlier in 1939 on East 54th Street in Manhattan. Peggy Guggenheim closed Guggenheim Jeune with a farewell party on 22 June 1939, at which colour portrait photographs by Gisèle Freund were projected on the walls. She started making plans for a Museum of Modern Art in London together with the English art historian and art critic Herbert Read. She set aside $40,000 for the museum's running costs. However, these funds were soon overstretched with the organisers' ambitions. In August 1939, Peggy Guggenheim left for Paris to negotiate loans of artworks for the first exhibition. In her luggage was a list drawn up by Herbert Read for this occasion. Shortly after her departure the Second World War broke out, and the events following 1 September 1939 made her abandon the scheme, willingly or not. She then "decided now to buy paintings by all the painters who were on Herbert Read's list. Having plenty of time and all the museum's funds at my disposal, I put myself on a regime to buy one picture a day." When finished, she had acquired ten Picassos, forty Ernsts, eight Mirós, four Magrittes, four Ferren s, three Man Rays, three Dalís, one Klee, one Wolfgang Paalen and one Chagall among others. In the meantime, she had also made new plans and in April 1940 had rented a large space in the Place Vendôme as a new home for her museum. Her collection became one of the few European collections of modern art to promote a significant number of works by Americans. In the 1950s she promoted the art of two local painters, Edmondo Bacci and Tancredi Parmeggiani. By the early 1960s, Guggenheim had almost stopped collecting art and began to concentrate on presenting what she already owned. She loaned out her collection to museums in Europe and in 1969 to the Solomon R. Guggenheim Museum in New York City, which was named after her uncle. Eventually, she decided to donate her home and her collection to the Solomon R. Guggenheim Foundation, a gift which was concluded inter vivos in 1976, before her death in 1979. Grave of Peggy Guggenheim, next to a plaque remembering her Lhasa Apsos (dogs). Peggy Guggenheim is portrayed by Amy Madigan in the movie Pollock (2000), directed by and starring Ed Harris, based on the life of Jackson Pollock. A play by Lanie Robertson based on Peggy Guggenheim's life, Woman Before a Glass, opened at the Promenade Theatre on Broadway, New York on March 10, 2005. This is a one-woman show, which focuses on Peggy Guggenheim's later life. Mercedes Ruehl played Guggenheim. Ruehl received an Obie award for her performance. In May 2011, the Abingdon Theater Arts Complex in New York features a revival of this play, starring veteran stage actress Judy Rosenblatt, directed by Austin Pendleton. In Bethan Roberts' first play for radio, My Own Private Gondolier, Peggy Guggenheim's troubled daughter, Pegeen, leaves her three children behind when she travels to Venice to spend the summer with her mother. Pegeen is in retreat from a marriage that has failed. She is determined to be an artist, and she shuts herself up in the dank basement, trying to paint. Meanwhile, her mother, Peggy, is much more concerned with the English sculptor who has come to visit; she wants a piece of his work to add to her collection and will use everything at her disposal to achieve her aim. She will even try to coax her daughter into the plan if she thinks it will get her what she wants. Peggy is well known as a collector of men, as well as art. As the summer progresses, and the strains between mother and daughter grow, it is only Gianni, Peggy's personal Gondolier, who can provide a welcome diversion. The play was first broadcast on BBC Radio 4 on Oct. 19, 2010. Peggy Guggenheim was played by Fiona Shaw. Pegeen Vail was played by Hattie Morahan Jack. In April 2015, a new documentary film, Peggy Guggenheim: Art Addict , began premiering at film festivals, including the San Francisco Jewish Film Festival on July 26, 2015. ↑ "Living My Life | The Anarchist Library". theanarchistlibrary.org. Retrieved 2017-07-31. ↑ Laurence,, Tacou-Rumney,. Peggy Guggenheim : a collector's album. Paris. p. 84. ISBN 2080136100. OCLC 35396116. ↑ Shenker, Israel (December 24, 1979). "Peggy Guggenheim Is Dead at 81; Known for Modern Art Collection". Encyclopedia Titanica. ↑ "Peggy Guggenheim Collection". guggenheim.org. The Solomon R. Guggenheim Foundation. 2004. Retrieved 14 June 2017. ↑ Out of this Century: Confessions of an Art Addict, Peggy Guggenheim, published by Andre Deutsch, London. 2005. Gill, Anton. Art Lover: A Biography of Peggy Guggenheim. New York, NY: Perennial. ISBN 0-06-095681-X. Prose, Francine (2015). Peggy Guggenheim – The Shock of the Modern. Yale University Press. ISBN 978-0300203486.